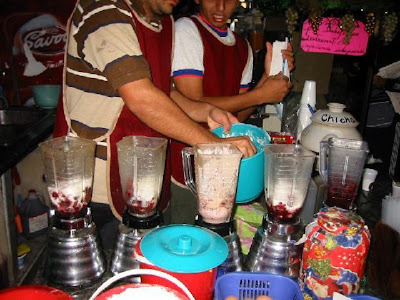 Venezuelan Food and Drinks: El Levanton - Man enough for a Merengada? Some milkshakes you can't prepare for. I remember waking up one Sunday morning in Merida feeling like death warmed up after a fun-filled night of beer and rum that probably went on too long. Luckily, one of my "panas" (mates) from the Andean capital had the perfect solution and took me to a juice bar in the Mercado Principal where he insisted on ordering a pick-me-up called El Levanton. "Don't worry panita," he said, encouragingly, "this is guaranteed to kill that kangaroo in your head." After what seemed ages, the creamy milkshake finally arrived. It looked innocent enough but tasted too salty to be just fruit and milk. It had a whiff of alcohol about it and a definite aftertaste of cod liver oil, but I soldiered on thinking I couldn't feel any worse. In fact, I was already feeling better. The milkshake went down smoothly and it was only after my laughing buddies told me that it contained milk, papaya, melon, carrot juice, ice, sugar, a wine called Vino Sanson, some homemeade spirit called Chuchuguasa, a raw chicken egg, two raw quail eggs, fish roe and a bull's eye that I came over queasy. "All the vitamins you'll ever need," the grinning juice guy said, "and it's a powerful aphrodisiac, so be careful with the chicas." Honestly, I told him, the way I feel the chicas have nothing to worry about. Undeterred, he told me that I should try "El Super Levanton", with extra shots of brandy and more bulls' eyes, if I was still in need of hangover help. But that was enough for me. I had consumed all the hangover cure I could take that day - magical aphrodisiac or not - and after a few cheese empanadas and a couple of strong black coffees I was well enough to go back to bed.